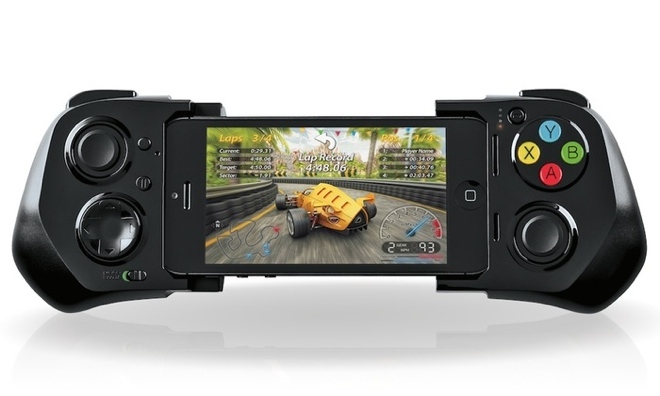 MOGA's launch marks the first authorized Made for iPhone gaming controller to hit the market. Support for dedicated controllers was introduced in September with the launch of the iOS 7 mobile operating system. The $99 MOGA Ace Power is compatible with Apple's 4-inch Lightning-connected devices: The iPhone 5, iPhone 5c, iPhone 5s, and fifth-generation iPod touch. It also comes with an 1,800mAh battery to recharge a device on the go. In terms of physical input, the MOGA Ace Power includes two joysticks, a D-pad, front-facing A, B, X and Y buttons, and L1, R1, L2 and R2 shoulder buttons. The MOGA controller features a collapsable design that makes it more portable for on-the-go gaming. Once expanded, users can pop an iPhone or iPod touch in the center, placing the physical controls to the left and right of the iOS 7 device's screen. The controller connects to the iPhone or iPod touch through the Lightning port, meaning the device is only capable of physical wired connections for control. That means the MOGA Ace Power cannot support Apple's other portable iOS devices in the iPad lineup. Games must be updated to support third-party controller accessories, and unsurprisingly at launch the number of compatible games is somewhat limited. Initial titles include Oceanhorn, Bastion and LEGO Lord of the Rings.